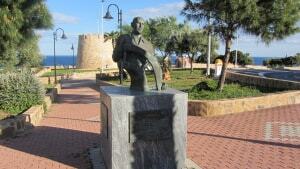 In 1962 the Swede, Nils Gäbel, “discovered” Torrevieja as an expat destination whilst he sailed around the Mediterranean. The statue to him by Torre del Moro (pictured) bears memory to him. From that date until 2000 there was a trickle of foreign residents who made Torrevieja their home or at least their second home. Swedes favoured La Rosaleda and El Limonar and the Belgians were attracted to the Torretas. La Siesta and San Luis welcomed people from all over Europe. Then came the boom years of Torrevieja. The population doubled from 50,000 to 100,000 and the infrastructure tried to keep up. 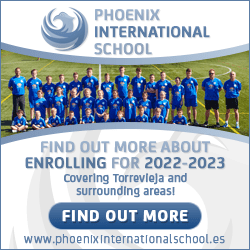 Torrevieja’s population exceeded those of other popular destinations such as Fuengirola and Benidorm. The big difference between Torrevieja and Fuengirola, Torremolinos and Benidorm was that the foreigners were not coming for two weeks of sun and sand ….. they were coming to live. Tens of thousands of North European pensioners sold up lock, stock and barrel, and purchased their bit of Spain. The quality of life, the superb climate and the relatively inexpensive property prices were the three reasons normally quoted. So, in those ten short years at the beginning of the millennium, Torrevieja moved from a quiet town much loved by Madrid holidaymakers to a major expat destination. 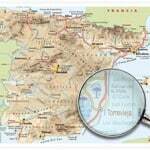 Similar stories can be told about Orihuela, Rojales and Guardamar. Even the sleepy inland villages of Los Montesinos, San Miguel, Dolores and Algorfa changed to hugely cosmopolitan centres. Although the property bubble burst in 2008, the area is still hugely popular for North Europeans and is one of the most vibrant property markets on Spain. Estate agents have come and gone over the past 10 years but one company has always been at the forefront of property investment in this area, Girasol Homes. They realise that the developers have reacted to the mistakes of the past. The builders and developers are now focusing on modern, high specification but reasonably priced homes and apartments. 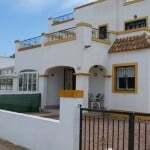 Many of these properties, plus many thousands of other properties in the Alicante region are on the Girasol Homes website. 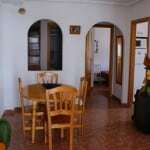 If you are looking for a property in Spain, you will find that Girasol are a company who will offer you choice, quality and value. They will hold your hand through the entire process whether you are a first-time buyer with no knowledge of Spain, Spanish or the buying process or an experienced investor. 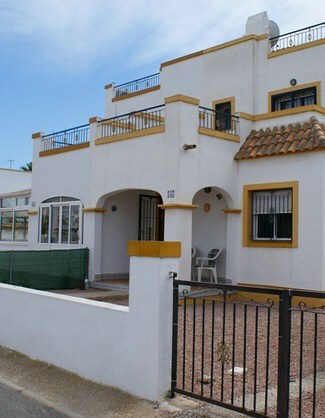 3 bed/2 bath quad available immediately in the prestigious Jardín del Mar 7 area of Torrevieja. 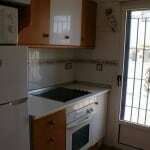 This well-maintained and furnished property is offered with immediate vacant possession. Jardín del Mar is 5 minutes’ drive from Torrevieja Town centre and is within easy walking distance of the Habaneras Centre and the Carrefour Hypermarket. The salt lake and the Park of the Nations are a few minutes further. The property consists of a lounge/diner with separate kitchen and a single bedroom/study and shower room on the ground floor. 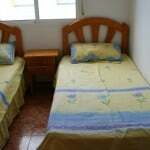 On the top floor there are two further double bedrooms and a full bathroom. The master bedroom benefits from a sun terrace. 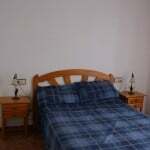 All bedrooms have quality fitted wardrobes. There is off-road parking in a pleasant no-maintenance garden. 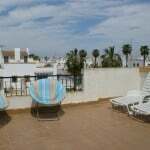 There is a large roof terrace that offers great views of the town and the surrounding mountains. 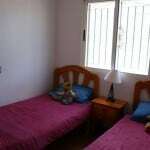 The property is cabled for expat TV/voip services etc and is on a cul-de-sac with only eight properties. Price (reduced to) 109,000 euros. Telephone 602 483 412 or use the contact form below to arrange a viewing. Click on the thumbnails for full size images.